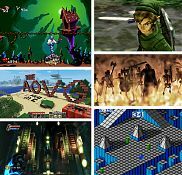 Among the games included in “The Art of Video Games” at Hudson River Museum are, clockwise from top right: The Legend of Zelda (2006); Diablo II (2000); Marble Madness (1992); BioShock (2007); Minecraft (2009); and Earthworm Jim (1994). 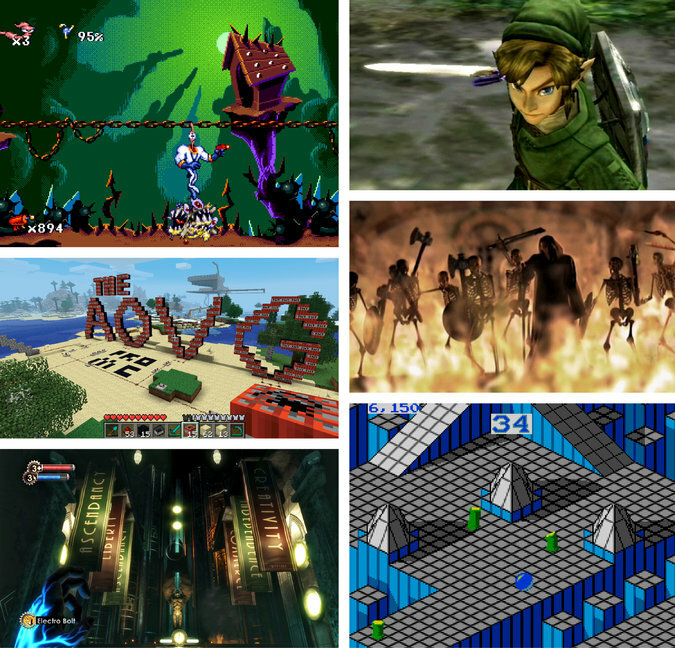 Credit Clockwise from top right: Nintendo of America Inc.; Blizzard Entertainment Inc.; SEGA Master System; 2K Games Inc. and Take-Two Interactive Software; Notch Development AB; and Interplay Entertainment Corp.
A benchmark for video games as cultural artifacts came in 2012 when the Museum of Modern Art in New York announced it had acquired 14 games for its collection. Depending on your perspective, the museum might be a little late in acknowledging the significance of video games — or early, compared with other art institutions. (The games were acquired by the museum’s department of architecture and design, putting them in the “design” category rather than alongside painting and sculpture.) Now, an ambitious survey of video games organized by the Smithsonian American Art Museum, and previously on view there, is at the Hudson River Museum in Yonkers. The earliest eras are the most interesting. “These are what old-fashioned video games looked like,” a woman was telling a group of children during my visit. And like the recent film “Computer Chess” (2013), which recreated with reverent, fetishizing precision the look of the early personal computer era, the games here benefit from that same nostalgic revival. Here you’ll find Combat (1977), Pac-Man, Space Invaders (a 1980 version) and Pitfall (1982), as well as an Atari VCS joystick and console in a display case. The early games demonstrate the ingenuity of designers working with limited colors and pixels: for Donkey Kong (1982), Shigeru Miyamoto put a cap on his famous Mario character because hair was difficult to render; TRON: Maze-Atron (1982) reveled in recreating the internal circuits of the computer, which were still somewhat novel. The video game as a narrative medium, like film or television, is traced through games like The Bard’s Tale III: Thief of Fate (1987), The Legend of Zelda series and Tomb Raider (1996), which was important for introducing a female protagonist — notable given charges of sexism in the gaming world (which, as many gamers have pointed out, reflects the larger culture). Video games are also tied to art and literature: Dune II: Battle for Arrakis (1993), took its inspiration from Frank Herbert’s 1965 novel “Dune;” BioShock (2007) drew from Ayn Rand; Marble Madness (1992) was inspired by the work of artist M. C. Escher; while Rez (2001) looked to the abstract paintings of Vasily Kandinsky. In general, however, the exhibition focuses too much on mainstream commercial video games and stresses too often the evolution toward realism — a paradox, since art has generally and systematically rejected all claims to the “real” in recent centuries. Video-games-as-art aside, the works here are being given the “art” treatment by their inclusion in a provisional canon of “great” works. It’s important to note these were chosen from a pool of 240 games suggested by Smithsonian curators and a board of advisers. More than 119,000 people in 175 countries voted to choose the 80 games that appear in the exhibition, according to a news release from the museum. Instead, the show suffers from a kind of boosterism that ranges, particularly in accompanying video testimonies, from the predatory (“If you don’t play video games yet, we’re going to get you”) to the absurd (“I’ve always said that if Beethoven were alive today, he’d be a video game composer”). More to the point, since “The Art of Video Games” uses, as the curator Chris Melissinos puts it, the “cultural lens of an art museum” to consider video games, it would be nice to see that platform fully utilized. Given the mainstream thrust of the show, why are controversial yet widely popular games like Grand Theft Auto not included? And what about the links between video games and violence — or war games, since the United States military developed its own video game America’s Army as a recruitment device and some scholars have called the use of drones in Afghanistan and Pakistan a “PlayStation War”? Video games are a cultural juggernaut; time will tell if they are also “art.” In the meantime, the apparatus of the art museum offers a laboratory for putting the medium through its paces and challenging the myths around gaming, rather than merely repeating them — which makes this a good early, rather than definitive, exhibition for exploring this relatively new form. “The Art of Video Games” is on view through May 18 at the Hudson River Museum, 511 Warburton Avenue, Yonkers; (914) 963-4550 or hrm.org.